When looking at scopes, there are 1000 different elements to consider. One of these elements is eye relief. If you’ve read about your scope, but still don’t understand eye relief than you’ve come to the right place. Eye relief is a critical element to the functionality of your scope. Choosing the wrong eye relief can mean that your scope will not work for your rifle or handgun. What Does Eye Relief Mean? When talking about eye relief you have to understand what it means with regards to you and your weapon. Eye relief refers to the distance required for the lens of the scope to your eye for optimal focus. Short eye relief on a weapon is typically anything less than 5 inches, and 6 inches or more would be a long eye relief. If you have a short eye relief scope, your eye will be relatively close to the lens of the scope. Short eye relief also requires that you mount your scope further back on your weapon. Long eye relief means that you’ll be able to mount your scope further up on your weapon. Long eye relief scopes are also compatible with handguns. Understanding the basic difference between long and short eye relief is the first step to choosing which style of scope to get for your rifle. Scout mounting a scope allows you to have a wider field of view. Many riflemen with scout mounted scopes are able to shoot with both eyes open allowing them quick target acquisition. The situational awareness that comes along with having both eyes open and a wide field of view can mean the difference between a kill shot and a missed buck. The long eye relief scopes allow for a more natural shooting position for some marksmen. Some find that the forward position of the scope gives them a more relaxed shooting posture that doesn’t require them to crane their neck. This can make a long day of shooting much less tiring. With bolt action rifles a long eye relief may be preferred for easy chambering. The scope can be mounted forward of the action on the rifle allowing you quick access. Having the ability to rapidly reload a bolt action can make all the difference when taking a second shot at a moving target. Long eye relief scopes have limited magnification. While they do have magnification and provide additional clarity compared to iron sights, their magnification is small compared to short eye relief scopes. The average power for a short eye relief scope will easily hit 8-10 and higher. In contrast, a long eye relief scope will usually not hit more than a power of 6 to 8. When inexperienced gun owners think of a scope, they typically picture short eye relief scopes. These are the scopes that require you to be up close to the lens of the scope. The short eye relief scopes are great for rear mounting and can offer additional magnification and reticle options that long eye relief scopes cannot. For short eye relief scopes, you can get away with 2-inch eye relief for light recoil guns and 4-inch for heavy recoil. If you want to avoid hitting yourself in the face, it is best to give yourself a bit of extra room. Some of the shortest eye relief distances are 1.5 inches, but you will need practiced skill to use these. 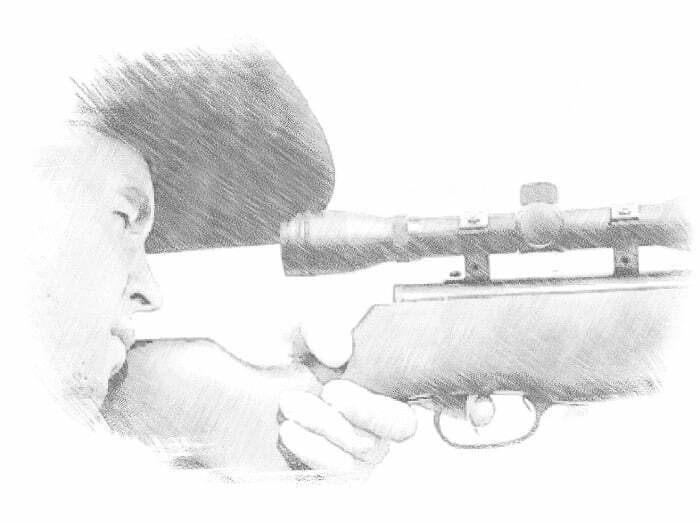 For many riflemen, when the scope is mounted further back on the rifle provides them with an added view at true one. Though, these scopes still require single eye use to target effectively. They provide the highest levels of magnification and are ideal for those who want to take long range shots. Short eye reliefs can make a rifle feel more balanced since you are not placing a lot of weight at the front of the gun. This will allow for a comfortable hold while firing. Depending on the total diameter of the lens you can have a fairly large scope rear mounted without throwing your weapon off balance. There is not as much sighting flexibility with a short eye relief as there is with long eye relief. Target acquisition at high magnifications can be difficult for new shooters and may present problems. The slower sighting is compensated for with the additional reticle options. Many short eye relief scopes will have advanced reticles that allow you to make windage and elevation calculations easily. Choosing a short eye or long eye relief is going to depend greatly on the style of shooting you do. You will also want to consider your natural body position compared to the position of the scope when shooting. Your choice may come down to comfortable shooting over magnification levels. Understanding the primary differences between short and long eye relief is going to give you a hand up when shopping for your scope.